Process for the production of nodular graphite cast iron. It is the further development of the sandwich process. Similar to the sandwich process, the master alloy is filled into a pocket and covered. 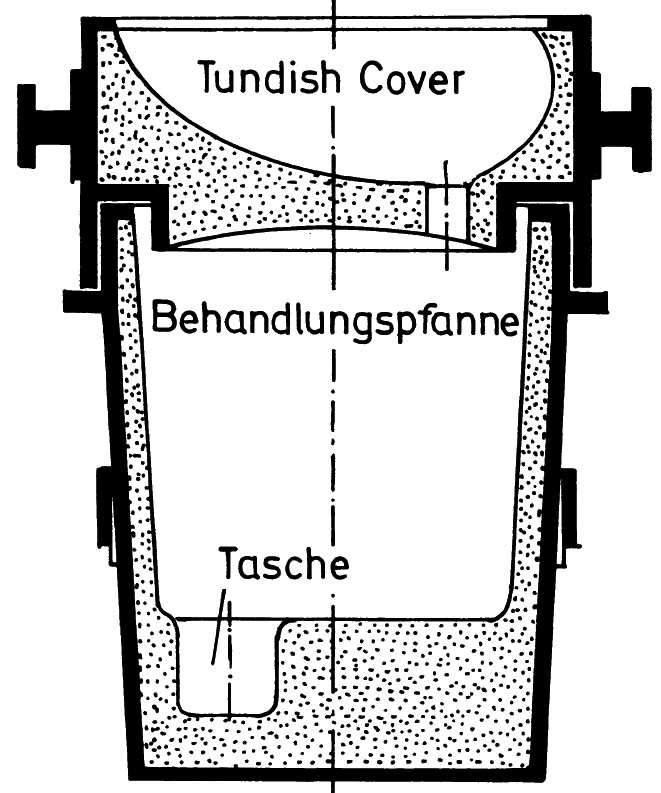 In order to reduce oxidation and the generation of smoke, the treatment tundish is covered with a lid. a) The limited supply of oxygen during the magnesium-iron reaction considerably decreases magnesiumoxidation and thus the generation of MgO vapor. The generated vapor cannot escape the inside of the tundish. The magnesiumpartial pressure in the tundish atmosphere increases. Only a small ratio of smoke can escape to the ambient air. Thus, there is no need for expensive extraction units and filter technology. b) Since less magnesium is consumed during oxidation, the treatment features higher efficiency. Compared to any other familiar treatment process with master alloys, the tundish cover process provides the highest magnesium yield. The tundish cover is usually fastened to the tundish by means of clamps, screws or wedges. Only in exceptional cases is the cover simply put onto the tundish keeping it closed by its own weight. The master alloy is filled into the provided pocket in the tundish bottom through a separate opening. It is advisable to cover the master alloy similarly to the sandwich process. The base iron flows through the filling opening in the cover into the tundish. Since it is not possible to control the bath level in the treatment tundish, it is mandatory to control the treatment weight with scales. The tundish cover process is presently the most popular treatment process.